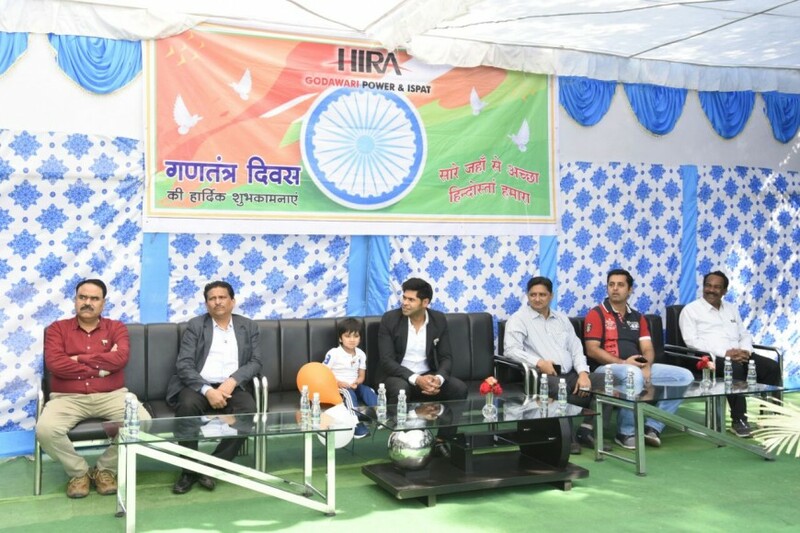 Like every year, this year also 69th Republic Day was celebrated at Godawari Power and Ispat Ltd on 26 Jan 2018 with full of enthusiasm and patriotic spirit. In this occasion Shri Abhishek Agrawal, Executive Director hoisted the National Flag followed by chanting of National anthem. In this jingoistic occasion Guard of honour was also given by Security staff of GPIL in the reverence of National Flag. Subsequently a cultural programme was also organized, where artist of GPIL were sung various patriotic song. In this August occasion, Shri Abhishek Agrawal,Executive Director addressed the gathering and greeting to all employee/workers for their bright future ahead. He also given emphasis to adopt safety precaution during working. Sri Vivek Agrawal, COO, Sri Vinay Sandilya, HOD Power, Sri Rahul Karwal, HOD Steel amongst other senior official Raghvendra Singh, RC Purohit , Debashis Das were also present. Sri Vivek Agrawal, COO during his addressed also stressed that we all employee/workers of Industries are also giving service to the nation scarifying valuable time for nation building.